How to get to HK Disneyland from Dorsett Far East Hotel? My family will be staying at Dorsett Far East hotel in Hong Kong. I want to know how to get to Disneyland from our hotel...and may I know the last trip of the train from Disneyland to our hotel, Dorsett Far East...thanks! Comments for How to get to HK Disneyland from Dorsett Far East Hotel? Re: How to go to DORSETT FAR EAST hotel from Tsim Sha Tsui area? Dorsett Far East Hotel is situated at 135-143 Castle Peak Road, Tsuen Wan, Kowloon, Hong Kong. The most efficient way to travel between Dorsett Far East Hotel and Tsim Sha Tsui area is by taking the MTR trains. Here's how. 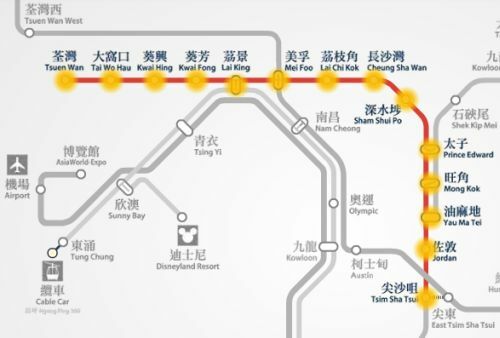 Walk about 5 minutes from your hotel to the nearest MTR station which is the Tsuen Wan station Exit B2, please click here to see walking route map. Get into the Tsuen Wan Line trains going to Central and get off at Tsim Sha Tsui station. Train travel time is 26 minutes @ HK$8.2 (using octopus card). Take Exit B2 and follow route map below. Here's my personal itinerary recommendation to maximized your day in Tsim Sha Tsui area. Museums --> TST popular shopping mall like Harbour City (for dining and shopping) --> Clock Tower --> Avenue of Stars --> Symphony of Lights --> Street Market shopping (optional). Here's the Tsim Sha Tsui attractions and nearby point of interest. How to go to DORSETT FAR EAST hotel from Tsim Sha Tsui area? WHAT ARE THE OTHER ATTRACTIONS LOCATED NEAR THE Tsim Sha Tsui area? HOW LONG DOES IT TAKE TO GO TO THE HOTEL? HOW TO MAXIMIZE OUR TIME AT Tsim Sha Tsui area? Re: How to get to HK Disneyland from Dorsett Far East Hotel? Last train from Disneyland to Tsuen wan is at 0040 hrs or 40 minutes past midnight. But we would advise you to go 1 hour before that time. Please click here to know your hotel location. Get into Tsuen Wan MTR trains station. Take the MTR trains and get off at Lai King station. 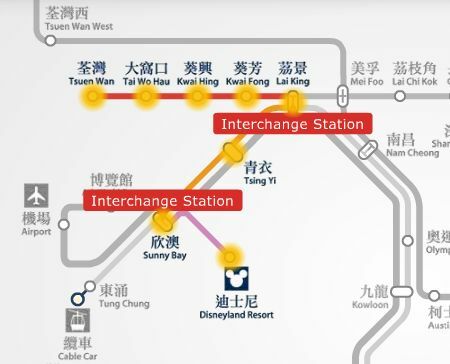 Interchange trains to the Tung Chung / Disneyland Resort Line towards Tung Chung but you need to get off at Sunny Bay station. Interchange trains to the Disneyland Resort Line from Sunny Bay station to Disneyland.